Nobody’s better at failure than Steve Jobs. Jobs, who stunned the computer industry on Wednesday with his resignation as chief executive of computer giant Apple Inc., has failed time and again, occasionally in spectacular fashion. He’s introduced products that bombed. He sent his companies in directions that went nowhere. 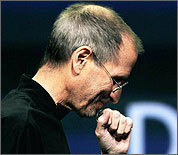 And once, he was kicked out of Apple itself, an event that led to one of the greatest second acts in American business. Fifteen years after he returned as chief executive, he’s lifted Apple from near-bankruptcy to a stock market value of $300 billion, second-highest of any US company. Jobs and Apple cofounder Steve Wozniak launched the personal computer era with the Apple II in 1977. But Apple found it hard to stay on top. Its next major product, the Apple III, was plagued by faulty construction, and thousands were recalled. “When the III was going down, it looked like the end of Apple,’’ said Bob Metcalfe, co-inventor of Ethernet networking technology and a professor at the University of Texas at Austin. Apple and Jobs survived that fiasco, but followed it up with another in 1983: the Lisa computer. Designed as a dream machine for advanced users, its $10,000 price frightened off customers, and few were ever sold. The greatest of Jobs’s failures occurred in 1985. A year after the release of the iconic Macintosh computer, one of the company’s most influential products, he was ousted in a coup led by John Sculley, the man Jobs had recruited to be Apple’s chief executive. On the rebound, Jobs founded NeXT Inc., a company that built desktop computers with advanced technology. People who knew computer hardware were awed by the new machines. “I remember being very impressed with how well they were put together,’’ said Al Hilwa, a software analyst at IDC Corp. in Redmond, Wash., who once worked as a computer technician at a company that purchased hundreds of NeXT machines. But NeXT machines were costly, and incompatible with other desktop computers. NeXT sold a grand total of 50,000 machines, and threatened to leave Jobs as a footnote in the history of digital technology. Still, as was the pattern in Jobs’s career, success was born of the failure. The NeXT’s incompatible operating system software was a blessing in disguise, robust and highly reliable compared to Microsoft Corp.’s Windows software, or the software then used on Apple’s Mac computers. Apple executives knew the Mac badly needed an upgrade. So in 1996, they struck a deal with their ex-boss Jobs to buy NeXT for $429 million. The NeXT computer didn’t survive, but its operating system became the basis for the Mac OS X software that runs Macintosh computers today. Suddenly, Jobs was back at Apple. Within a year, he ousted the previous chief executive and regained total control, imposing his creative vision on every Apple product. The result was a long string of hits, and a fair number of misses. There was the overpriced, hard-to-upgrade Cube desktop computer. That was followed by the ROKR, an ill-fated partnership with Motorola Inc. to build a cellphone compatible with Apple’s iTunes music service. But those failures were overshadowed by the massive success of the iMac computer, the iPod music player, the iPhone, and the iPad. The key question for Apple, she said, is whether new chief executive Tim Cook will prove to be as good at losing as Steve Jobs was. both Wall St., Main St.
What do you think has been the most influential Apple product?